Strzeminski’s Synthetic Composition 1 of 1923 is a work at the height of his achievement. As an early work it lays ‘in-between’ his years in Smolensk and the Unism works that properly begin in 1924. Thus it can be viewed as a transitional work where, through pictorial practice, he was developing a studio strategy that has parallels with diverse groups of his works from the 20s and the 30s. Synthetic Composition 1 (see figure 1) raises a series of questions that reveal the complexity of what he was formulating in the early 20s. On the one hand, and on his return to Poland from his years in Russia, there is a questioning of Suprematism and UNOVIS positions. The label ‘Post-Suprematism’ for this work is not merely a marker on the time line of his transition to Poland. It is clear from another work, Still Life 3 (see figure 2) from the same year that he is simultaneously working through his relationship to cubism, the critique of which will become central to his thinking. By default the beginning of his formulation and critique of Baroque painting , with which Strzeminski would associate Cubism, has its seeds here. In short, the thinking we find in his Unism essay of 1928 (1) for which B = 2 from 1924 (2) can be seen as a draft, appears to be at work in the paintings from 1923. There seems to be another series of questions that need raising before entering into a discussion about this painting as somehow being at a moment where Strzeminski is simultaneously attempting to distinguish pictorial construction from the Baroque, Cubism and Suprematism. None of the shapes is derived from a clear necessity of its existence; it is needed indirectly for other shapes but not for itself and for the picture. By looking for contrasts one will not find a connection between shapes that would ensure a uniform painterly organism. The opposing shapes will always remain enemical, forever alien, producing the tension of a condensed, rich and powerful form, full of dramatic contrasts of shapes, the form which forces a unity of external connections through coercion but which will never result in a painterly organism whose parts are connected through inner logic (3). The analysis of all painting in the Baroque tradition should lead to the conclusion that the Baroque has not been capable of creating a genuinely uniform painterly organism (4). Organic and organism are peppered throughout Strzeminski’s writing and seem to point to, not only the idea of unity and autonomy, but also from where they are derived .Yve-Alain Bois, in his essay on Strzeminski and Kobro (5), also brings attention to this term but in the guise of organicity. His discussion pulls toward how it can be seen as part of the radicalization of notions of medium and specificity. However Organicity suggests a wider frame of reference that subtends this formal reading . Where is it derived from? What other contexts does it evoke? How, if at all, was it put to work in Strzeminski’s practice? As suggested, in 1923 there are many contrasts and conflicts at work in the world Strzeminski found himself in. The move from Russia also spelt a distancing from central tenants of UNOVIS and Suprematism; the aftermath of Cubism brought with it many questions, the Poland Strzeminski finds himself in is a diverse intellectual and artistic hub looking to forge a radical culture yet simultaneously responding and aware of what is happening in Paris, Italy, Russia and Holland. In 1923 there were also the beginnings of radical artist groups in Poland that would later manifest themselves as BLOK, Praesens and a.r. By 1922 the journal Zwrotnica had commenced publishing. The role of the journals associated with these movements is crucial here. The Polish avant-garde, like all of the ‘utopian’ movements of that time, saw themselves within an international intellectual context. a.r. believed that there should be an international collection in Poland, an ambition that Strzeminski was instrumental in achieving subsequently in Lodz. Strzeminski would have seen Cubist works in Russia as well as witnessing the production and practice of the resident radical artists. An additional element to this context is the means, dissemination and reception of ideas from elsewhere in Europe and particularly from Paris. ...applying the same test of an objective form to cubism, we have to state that Cubism in its early stages - in particular those preceding the important breakthrough of Ozenfant and Jeanneret around 1918 - is (essentially) the Baroque, consciously applying the principles that distinguish Baroque painting, though in a purified and intensified form (6). Quite what Strzeminski is referring to here when he points to the important breakthrough of Ozenfant and Jeanneret around 1918 is left open here, but 1918 seems to point to the publication of Aprés le cubism in that year. It was also around this time that Gaumont produced a newsreel about Cubism, its final section was titled After Cubism, Purism. Ozenfant boasts of this in his text, The Evolution of Purism. The intrigue here is the form of the reception of a set of ideas that were probably instrumental in forming Strzeminski‘s own position. Ozenfant and Jeanneret‘s Aprés le cubism, although very different from the complex critique of Cubism in his Unism text, points to a powerful position from which Strzeminski‘s thinking evolved. It would seem reasonable to speculate that Strzeminski‘s response is in some part through contact with the publication of Aprés le cubism, when he would have been in Russia. I have found no evidence in my readings that Strzeminski was ever in Paris and it seems unlikely he was there between 1918 and 1923, the year Synthetic Composition 1 was painted. This is to perhaps make a very obvious point. The circulation of ideas at this time was in the form of secondary sources and particularly journal and book form as much, possibly more after his stay in Russia, than having a sustained contact with actual avant-garde works of art (Strzeminski would have had contact with key works in Russia of the active generation of artists there but also of Cubist works. It is also probable that in Russia he would have had an early contact with Bogdanov/Pavlovian physiological ideas which could have played a later role in his Theory Vision). By 1922, the year of his crossing into Poland, there is a dramatic change. In that same year Strzeminski had published his Russian Art - Notes in the Polish journal Zwrotinica and in 1924 he was the co-founder of the BLOK association of artists and the publisher of the journal of the same name. Tadeusz Peiper, who was at the centre of Zwrotinica, seems to play a key role in these years. He had spent time in Paris up to the outbreak of the first world war the significance of which I will return to later. Context for Strzeminski in these years is as much a turn toward the form of the journal for the dissemination of his own ideas and feasibly the circulation of journals is reasonably also a conduit informing him about what is taking place elsewhere. 1918 is the publication of Aprés le cubism and 1920 is when publication begins of Ozenfant and Jeanneret’s L’Esprit Nouveau, Revue international de l’activité contemporain (to give it its full title). The question arises, if there is possible some form of artistic order that, not being supported on more and more dull geometricism, could still become the principle of a strict and logical construction of a work of art. It seems to me that such a form of order is possible and that sooner or later it will find its way into the field of art. It is the concept of organicity which is such a form. It as an organism that on some day will become the model for the construction of a work of art. The several parts of a work will be related to each other by a strict functional dependence which will constitute the unity of the work (9). A work of art will be socially organized. A work of art will be the society (11). Like Strzeminski’s unreferenced deployment of organism in his writing, Peiper gives no firm indication what he is referring to specifically by organism; what the origin of this term might be and who the key references are. There is much that can be inferred here. and many connections to a Paris based context can be linked to Peiper as a conduit of an over-arching background of ideas that informed Unism. For example if Peiper had attended Bergson’s lectures can it be assumed that there was a transmission of ideas that relate directly to long standing debates at work in biology at this time? Bergson’s élan vital appears in 1907 and becomes an important intersection in debates in biology along the lines of reductionism, holism, and vitalism. How this has any relation to Strzeminski’s use of organism in his formulation of Unism is open to speculation, even as a distant background, an osmosis of interactions (similarly the question stands whether Bergson’s challenging of Kant’s ‘confusion’ of time and spatial representation has any bearing on Strzeminski’s spatio-temporal formalisations). Strzeminski’s citing of Ozenfant and Jeanneret becomes significant here, directly in relationship to biology (and possibly via Peiper) but also in a more obtuse and complex form. Some references that appear in Ozenfant and Jeanneret’s output , and particularly in L’Esprit Nouveau published from 1920 to 1925, are significant here. "A philosophy of the history of the human race, worthy of itsname, must beginwith the heavens and descend to the earth, must be charged with the conviction that all existence is one—a single conception sustained from beginning to end upon one identical law." This quote not only uncovers a tone in Strzeminski’s writings, underpinning many aspects of Unism, but it also brings into focus a possible corpus of thought around Strzeminski’s use of organism in his thinking. Ratzel was a German geographer and ethnographer, his ideas later infamously became associated with Nazi ideology. His essay of 1901 Lebensraum (Living Space) was an early example of biogeography marking a shift form the idea of the nation state as a corpus to a an organic model of growth that chimed with imperialist ambitions. Darwin and Haeckel were major influences on Ratzel’s thinking. Haeckel’s work sought to develop Darwin’s ideas through phylogenetics, that maps organism’s evolutionary development and ontogeny which focuses on the biological development of cells and organisms. As with Ratzel, Haekel’s highly questionable theories became linked to racial theories that later would have catastrophic consequences in the 20th century. The point here is certainly not to link Strzeminski to this catastrophic form of evolutionary theory as extrapolated through biogeography and ontogeny. Rather, it is to highlight the context and influence of renowned late 19th century figures like Ratzel and Haekel as a background to what organism might infer. In Haeckel’s case there is also the fact that as well as being a biologist he was the illustrator of Kunstformen der Natur which was a major influence on many artists, particularly those associated with Art Nouveau. However the aim here is not to simply trace a line of influences from scientific thinking into Art Nouveau, Purism and then to Unism. Haeckel’s illustrations propagated a bio-aesthetic on a wide spread, even popular level. To this day there is still an industry in reproducing the illustrations from Kunstformen der Natur. The influence of Haeckel’s illustrations on Art Nouveau points to their presence being widespread in Europe by the 1920s. In L’Esprit Nouveau we find a rearticulation of a Haeckelesque bio-aesthetic except now through photography. In Ozenfant’s essay Modalities (12) the florid and lyrical character of the text seeks to make allusions between a macro and micro view of nature and the ethos of art he is proposing. The text is aspirational rather than philosophical, an exercise in provoking wonder in the reader and lends little to understanding where Ozenfant is deriving his material from. The photographs that illustrate this text and much of L’Esprit Nouveau are interesting here. 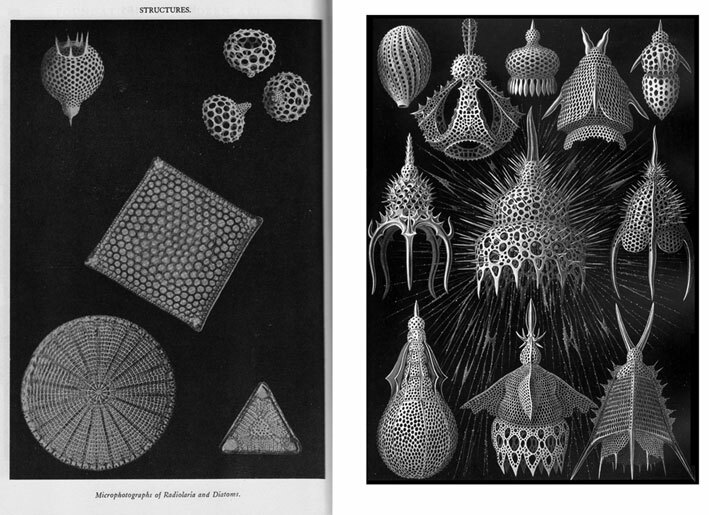 Microscopic images of diatoms and radiolaria are used and stand as photographic equivalents of Haeckel’s illustrations, recasting the romantic aesthetic, associated with the images from Kunstformen der Natur, under a veil of quasi-science and objectivity (see figure 3). There does not seem to be a comprehensive history of microscopic photography that I have found. It was worth noting that even when Haeckel’s Kunstformen der Natur was published in 1904 microscopic photography was highly advanced. As early as 1845 Donné and Foucault had produced an Atlas of microscopic forms in the form of engravings after micro photographs. Many of the images in L’Ésprit seem related to images published by Martin Gerlach in 1902-04. Gerlach’s project was to make photographically an equivalent to Haeckel’s illustrations. Interestingly widespread diffusion of such images was dependent upon the development and invention of printing techniques, in Gerlach’s case the Collotype, invented in the 1850s (13). The many scientific references and articles published in L’Esprit can be viewed in a number of ways that are significant in 192314. 1. 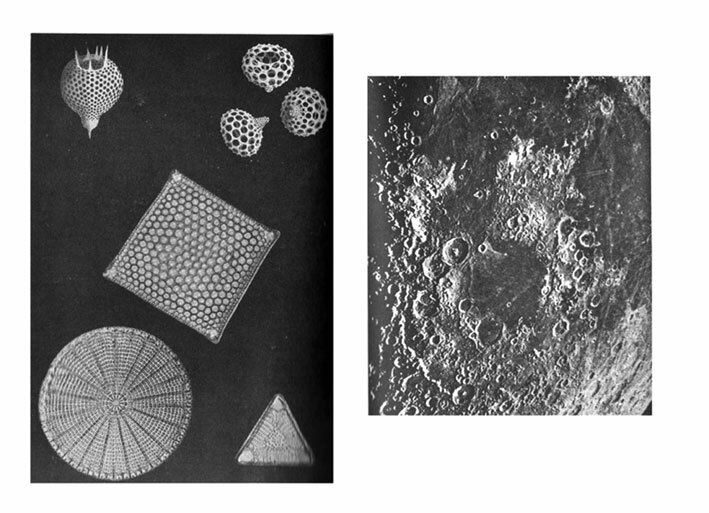 Biological material is presented, as previously indicated, as a contrast between microscopic and macroscopic images; an image of radiolaria with an image of the surface of the moon for example (15), (see figure 4). This can be interpreted as a reconfiguration of a sublime axis of representation to include the microscopic and primary organisms in evolutionary and structural taxonomies. 2. The Darwinist thread that runs through the wider biological context, at work by the 20s, and that is for certain immanent to the work of Bergson, Haeckel and Ratzel can be equated to the taxonomies found in L’Esprit. These are put to work in a number of ways. Broad allusions are made to links between structures in nature and in engineering, machines and architecture (e.g. 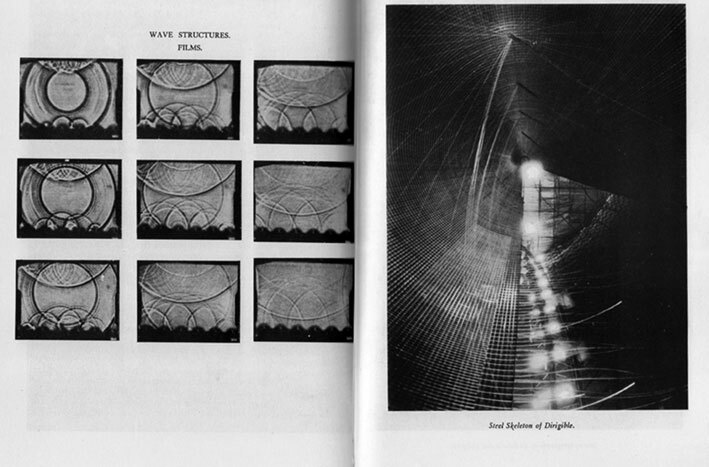 between ‘wave structres and the steel skeleton of the airships/dirigibles - see figure 5), (16). 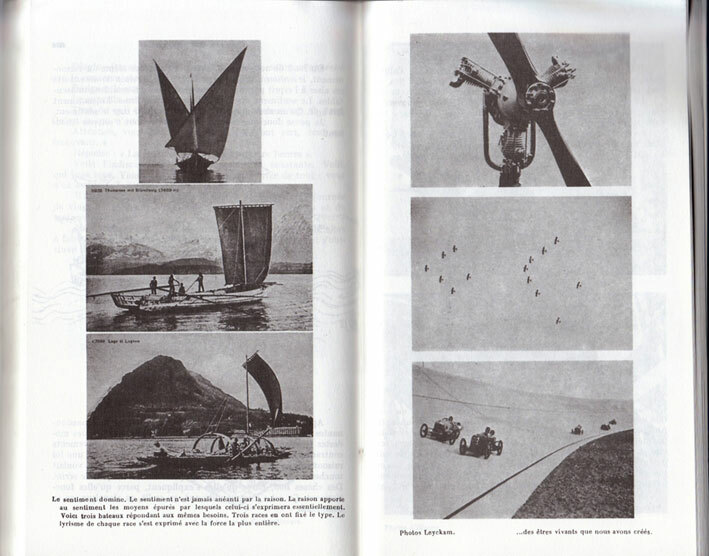 In L’Art Decoratif d’Aujourd’hui Le Corbusier performs a significant sleight of hand by presenting 3 images of boats from non-western cultures opposite three images of machines, an engine and propellor, a formation of aircraft and racing cars on a circuit (see figure 6). The boats are accompanied with “Le Lyricisme de chaque race s’est exprimé avec la force la plus entière” while the machines are underpinned by the caption “...des êtres vivants que nous avons crées”. Such a taxonomy places technology within cultural and arguably racial hierarchies but also lyrically naturalises the machine bringing it closer to an axis of nature (17). 3. Allusions to growth are made, equitable with cellular activity in the case of a photograph of a then contemporary American city (probably Chicago) and another image of a woman sitting with some model trains alluding to an historical evolution of speed. The caption reads “Growth of speed” (18). 4. As Susan Ball points out, the format of many of the schematic pages of L’Esprit “are set forth like propositions in a geometry text book”, examples of possible models of which exist in the archive of the Fondation Corbusier in Paris (19). This points towards considering L’Esprit as reconfiguring a scientific/technological sensorium in relation to the emerging artistic avant-garde. The large and widespread distribution of L’Esprit places it as a central resource for the dissemination of ideas and particularly for several versions of the organic and organism. The fact that much of this ideology is present in the structuring of images in L’Esprit is through visual modes of presentation as much as the textual content. The ability to read French (there seems no indication that Strzeminski was a French speaker), or to have contact with French linguists involved with this context (Peiper for example) would not be a necessity in gaining a schematic sense of the possibilities of these ideas derived from scientific, philosophical and geo-political disciplines. The key point here seems to be how the sensorium at work in L’Esprit can be considered to mark a switch in attitude from the structure of the ‘body’ as echoing the human anatomy to étres vivants in general (echoing the developments happening in science at the time that turned its attention to non-vertebrate organisms in general). The change in the idea of a corpus at work here appears significantly different. ‘Growth’ is problematised here, cellular forms, such as radiolaria, are as significant as much in how they group and connect together as a meta-form. Growth and connection are found repeatedly in Strzeminski’s texts to develop compositional concepts, “...the form which forces a unity of external connections through coercion but which will never result in a primary organism whose parts are all connected through inner logic” (20) being a good example. The discreet form as a unity and its constitution of a whole through connections being the major example. The connection being made here points to the context represented by L’Esprit possibly giving Strzeminski an oblique access to ideas of organicity that resonate at a number of levels in his formulations. Phenomenology, that Bois notes is implicitly the philosophical foundation of Unism (later explicit in Minimalism), (21), can be detected in the arborescence of references at work in L’Eprit and possibly through his encounter with Peiper. Arguably the biological context of ‘organicity’ is immanent to Strzeminski’s formulation of concepts of composition which is the essential dynamic of his thinking especially in the dichotomy he uses between Baroque and Unism (22). The complexity of organicity in Strzeminski’s texts is too easily diminished by it often being accompanied by allusions to nature and the ‘natural’, confusing its significance in the order of his thought. Indeed such a confusion seems to be something that Strzeminski himself experienced. The mood swings between the hard formalism of his major works of the early 30s and the naturalism of the land, sea and city-scapes he was making in parallel, points to the interesting uncertainty Strzeminski experienced in maintaining a singular pictorial strategy and indeed can be viewed as simultaneously engaging in a series of contradictory strategies. Alternatively the character of Strzeminski’s practice and its near and distant biological references can be seen as a response to the slippage between the idealist background of such a context in the 20s to the ideological consequences of ideas such as Ratzel’s Lebensraum in the 30s which was one of bedrocks of Nazi imperialism. His series West Byelorussia of 1939 are made at the moment that both Nazi Germany and Soviet Russia invade Poland the result being that West Belarus was annexed as a Soviet Socialist Republic. In 1939 Strzeminski fled Lodz and the advancing German army. His destination being Wilejeka that was soon to be occupied by the Soviets. Ozenfant’s citing of Ratzel’s famous phrase “a single conception sustainedfrombeginningto end upon one identical law” , forStrzeminski, had probably lost its utopian innocence way before the advancing tanks had pierced Polish borders. But what is certain is that Strzeminski’s lived experience would have introduced a complexity and a series of questions into his formal thinking; that the reduction of of a populace to what Agamben many decades later would describe as bare life was the catastrophic consequence of an ideology that owed much of its credo to evolutionary biology. Organicity which is best known to us from social physiology, will become the inspiration for artistic inspiration A work of art will be socially organised. A work of art will be the society (23). “Art ought to become a formal organization of the course of everyday events. This implies a relationship between art and the scientific organization of work and leisure, as well as its grounding in modern technology, psycho-physiology and bio-mechanics”(24). These comments, made a decade after Synthetic Composition 1 was painted, points to a continuing deepening and aquaintance with ideas, that in 1923, were embryonic. Bearing in mind Strzeminski’s engineering background, this does indicate biological models and ideas were a continuing and deepening context in relation to his practice and were not merely operating at an aesthetic level, bringing his ideas toward an axis of ‘nature’. A discussion about this any real detail is beyond my scope here and is outside of the brief of this paper. What is evident in the literature around Strzeminski is that this bio-context seems to remain at the periphery of discussions about his work and yet seems so decisive in forming his theoretical outlook and more importantly appears as an active model for his paintings from 1923 into the 30s. Similarly this bio-context, as indicated earlier, brings Strzeminski into a curious proximity with discussions that can broadly be described as bio-political. This was also the case with Ozenfant whose reintroduction of the human figure into his work in the late 20s point to a moving away from schematic ideas of organicity in favour of placing the human figure, once more, at the centre of a biological regime. His La Vie (also referred to as La Vie Biologique) painted between 1931-38 which he says ‘I noted the vicissitudes through which the painting passed as a result of political and social events . . .‘ (25) was a major artistic statement on Ozenfant’s part, rhetorically grandstanding doubts and positions which were certainly widespread by the 30s. The contrast with Strzeminski’s Byelorussia works is stark. His are an empirical response to an unfolding situation, a result of his own displacement within the brutal conflict and amorphorous borders of 1939. Hans and Sophie Arp have not been mentioned so far in this discussion. It is certain their work was important in Strzeminski’s constellation of references as is manifest in the presence of their works in the collection put together by a.r. in Lodz and specific references Strzeminski makes to Arp in his writing. My sense is that this impacted much later than 1923 in Strzeminski’s perspective and possibly served to underpin formulations he had already, by 1928, intuited. I may well be mistaken in this assumption. The significance of the Arp’s role in Strzeminski’s work is interesting in other ways. He does not share a sympathy to their earlier surrealist/dada affiliations. 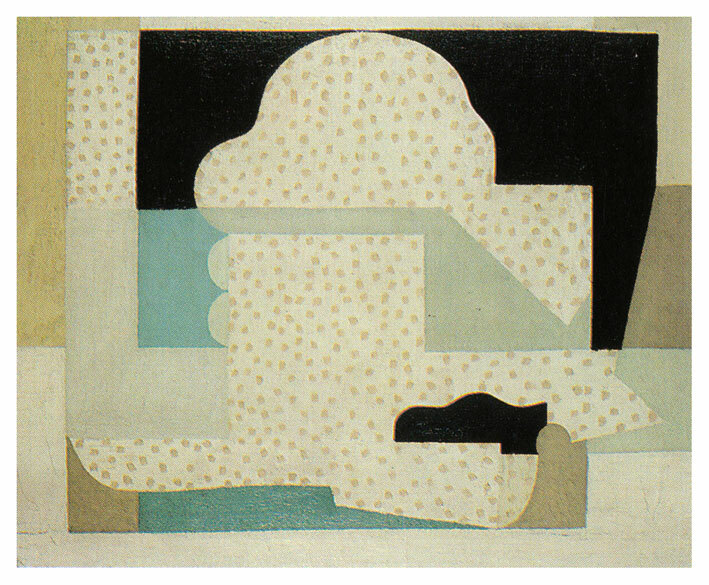 Strzeminski’s flirtation with the Parisian groups Cercle et Carré and Abstraction-Création, whose opposition to surrealism seems to mark the point at which Arp becomes a reference for Strzeminski. The conduit for this contact seems to be Henryk Stazewski’s (26) trips to Paris from 1929 -1934 (27) logically meaning that the Arp’s appear on the scene after the major aspects of Unism were formulated. The Arp’s designs for decorations and murals of the Aubette in Strasbourg in 1927-8, for which Van Doesbrg played the major role, does possibly seem significant for this discussion. The Aubette has not survived. The inherited consciousness of maximalized impressions stamped on the mind (engram) passes them on without taking cognizance of the direction of their emotional charge, simply as an experience of energy tensions; this unpolarized continuum can also function as continuum. The imparting of a new meaning to these energies serves as a protective screen (28). Introducing Warburg in the final sentences of this paper is to bring into focus the main thrust of the subject of this essay. Organicity seems to be apart of a sensorium that was being propagated on a wide spread if not popular level by the 1920s. The shift of publications, like LÉsprit, in using photography and didactic typologies on order to make connections between images constitutes a form of visual cosmology. I cannot imagine the Strzeminski who is also deeply involved with print matter and typography was not absorbing these forms of dissemination. For the purposes of this paper I have found it extremely difficult (in some cases impossible) to access primary material in the form of journals like L’Ésprit or those that Strzeminski himself was associated with in Poland. I’ve also found that the question of how images were propagated at that time invariably raises questions about the history of print techniques especially in relation to the reproduction of photographic images. Again such a history is not near to hand, or if it is has, it has escaped my attention and, admittedly, my lack of an effective research methodology. But it is here that Warburg seems highly relevant. The schematic use, by Strzeminski, of organicity with its biological backdrop points to an active cosmology to which the artefacts he would have been absorbing have fallen out of focus. I’m reminded here by Warburg’s observation that a study of the renaissance in Florence demands a study of the place of Northern European tapestries and fashion in its society. That there was a substantial transmission of ideas on a pan-European scale that would have been highly visible at the time but have, with time, fallen from sight. Such a pathology seems to me to be important to develop when looking at how a concept of ‘life’ shifts to the organism in Strzeminski’s thinking. The conference held at the Museum Sztuki in Lodz from the 13th to the 14th October 2011, and for where this paper was commissioned and presented, provoked a valuable discussion that has made pause to reflect and to add here some supplementary comments. In the feedback session of the papers where I presented there were two strands of discussion that were of value but that I only formulated a response sometime after the event. The first strand came from Tomasz Zaluski, who was chairing the feedback. He was asking if my paper related to a specific bio-political context and in terms of debates at work today. I would like to add here that I think this is the case but is in terms of how my artist practice relates to discourse and ideas and not from the rigours of an academic methodology. My own work for some time has, as a background, Agamben’s formulations of bare life and insidious structures of sovereignty informing its thinking. Warburg’s pathos-formula and the engram also play a significant role. However, I have encountered such ideas through a complex path; reading, discussion, chance encounter and most importantly looking at works of art, both historically and contemporary. In this sense I’m like any artist. Without making comparisons between myself and Strzeminski, when I was commissioned to write this paper I was intrigued by how his thinking would have been networked and embedded within a wider context. I noticed in the writing around Strzeminski how the bio and organic aspects of his work are annexed by commentators as being contextual to his work but never being seen as immanent to his thinking. The discussion with Jean-François Chevrier about this was, for me, interesting. He made the point that the biological has nothing to do with art. This a reasonable point to make. He also pointed out that Strzeminski’s series of photo-collages, My Friends the Jews, mark the point where Strzeminski becomes an anti-Unist; that he dialectically formed the anti-thesis of his own Unist position in response to what filled the space and life around him in Lodz during the Nazi occupation. Unism became for him untenable in the light of the horror and presence of the ghetto in Lodz where he lived. Arguably this had happened in Strzeminski’s work as early as 1939 in response to the events in Belarus. I found myself instinctively agreeing with Jean-François when he said art has nothing to do with the biological but also finding myself, simultaneously, convinced that Strzeminski’s turn to anti-Unism was a product of how the bio-organic background was immanent to the dialect that Jean-François so lucidly described. In this sense, and to answer Tomasz’s pertinent question, my response is that Strzeminski’s work really does contain important bio-political dimensions. In this he can be seen as not only the fore-runner of formalist practices, mainstream in the 1960’s, as so often discussed, but also in terms of the contradictions implicit in such positions; the décallage between ideal, event and history. Finally, in the bookshop of the Museum Sztuki in Lodz I purchased a publication of the materials of a conference about Strzeminski held at the museum in 1995. (29) In it I discovered Urszula Czartoryska’s excellent article, Measure, Light, Space. Strzeminski and Le Corbusier (30). Unfortunately I had not encountered this article prior to writing my paper but I must acknowledge that she has made very similar observations to mine about the role of L’Esprit Nouveau. Her article focuses on the important parallels between Le Corbusier’s ideas and Strzeminski’s that for me is a valuable counterpoint to the connections I make between Ozenfant, the organic and Strzeminski. 1. Wladyslaw Strzeminski , “Unism w malarstwie”, Bibljoteka Praesens (1928). 2.Wladyslaw Strzeminski, “B=2”, Blok November-December (1924). 3. Wladyslaw Strzeminski , “Unism w malarstwie”, Bibljoteka Praesens (1928), 9. 5.Yve-Alain Bois, “Painting As Model/Strzeminski and Kobro: In Search of Motivation in Painting As Model” (MIT Press Cambridge Massachussetts, 1990) 123-155. 6.Wladyslaw Strzeminski , “Unism w malarstwie”, Bibljoteka Praesens (1928), 5. 7. In Andrzej Plauszewski’s biographical note on Peiper, Constructivism in Poland (Muzeum Sztuki Lodz,1973), 132. 8. ibid., 59 - 65. 10. See Bois’s discussion about this concept in Painting as Model, 154-155. 12. Amédée Ozenfant, Foundations of Modern Art, (Dover Publications, New York, 1952), 276-298. 13. Much is owed here to Adam Lowe’s thoughts, research and writing and particulalry his and Piers Wardle’s Anish Kapoor: Unconformity and Entropy, (Madrid: Turner Ediciones 2009). 14.This was in apparent even in L’Esprit’s first issue from 1920 in which Victor Basch’s article L’Esthetique Nouvelle et la science de l’Art was published. 15. 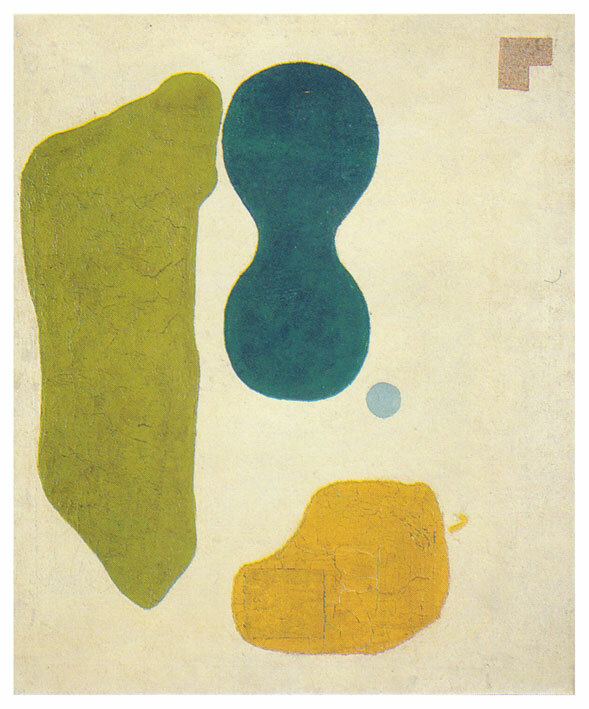 Amédée Ozenfant, Foundations of Modern Art, 291-292. 17. Le Courbusier, L’Art Decoratif d’Aujourd’hui, (Les éditions G. Grès et Cie, Paris, 1925), 170-171. 19. Susan L. Ball, Ozenfant and Purism, The evolution of a Style 1915-1930 (UMI Research Press, Michigan, 1978), 112 - 114. 20. Wladyslaw Strzeminski, “Unism w malarstwie”, Bibljoteka Praesens (1928), 9. 22. The implicit/explicit shift that Bois raises between Unism/Minimalism can also be expressed as a shift from biology to psychology as the subtending discipline, gestalt being a key concept under Minimalism. 23. Tadeuz Peiper, Masa. Maszyna, (Warszawa,Tedy, 1930). 24. Wladyslaw Strzeminski, Modern Art in Poland, 1934 in EU. 25. Foundations of Modern Art, 334. 26. Constructivism in Poland, 141. 28. Aby Warburg, Journal VII (1929), 255. 29.Wladyslaw Strzeminski, 1893-1952, Materials of the Conference (Lodz: The Muzeum Sztuki Library, 1995).